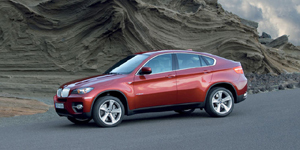 All-new for 2008, the X6 is what BMW calls a Sport Activity Coupe, an SUV with a coupe-like roofline. Powered by twin-turbocharged engines mated to a 6-speed automatic and all-wheel-drive, the X6 is indeed one of the best-handling SUVs available. Due to the sloping roof-line, the X6 seats only four people and offers limited trunk space.